Some people have it, some people don’t: a pulse. No, that’s not true, everyone has a pulse, but not everyone knows that. Of course, we’re speaking rhythm, not your actual pulse… but that’s a good place to start. If you put your hand on your heart, your neck or wrist, you can easily feel your heart beating, or your pulse. Even just sitting around, you can probably sense the beat of your heart as it rhythmically nourishes your body and mind. Your pulse, the beat of your heart, is a reminder that there is a rhythm to everything on the planet, and that your unique beat is an important part of that. But, then there’s that other pulse. The pulse of the drummer, percussionist or musician. That pulse that keeps us alive through the nourishment of rhythm. That’s a different pulse, all together. That’s the one that too many people think they don’t have or are too shy to cultivate. The pulse of rhythm in music does take some time to get to know and to encourage its growth… but once you’ve got it, you’ll never let it go. Finding your pulse can be a natural occurrence, or one that requires some work. You may have a pretty steady pulse when you’re drumming, or, you could need a little guidance to keep your timing together and not get carried away during fills, solos and just clowning around with friends. Even the best drummers know that the pulse they are following can be elusive, and getting caught up in the moment (or, even while learning a new beat) easily sidetracks the pulse and there is little left besides moments of rhythm and chaos. That’s not to say those aren’t fun moments, but, they can work against the foundation of the pulse. From that foundation and stability, the pulse becomes a more complex rhythm, but, it still remains fixed and strong. Most people consider drummers to be pretty good at the whole rhythm gig, with a natural pulse that keeps a song steady. But, even drummers can struggle with keeping a steady beat, especially in the beginning. The rhythm that you want to play can sometimes get lost in the moment where you’re trying to play your drums with the right hand or stick technique, or you’re playing with others who are throwing off your groove. Some drummers use pulse tracks when they’re starting a new song, or, there’s the tried-and-true metronome that can keep your rhythm in line. In fact, using both pulse tracks and a metronome alone can help anyone connect to their inner pulse with more than a practical benefit to the steady beat, but, a way to use rhythm for its wellness benefits, too. 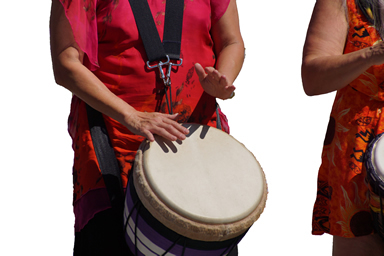 Increasingly, people are turning toward rhythm and drumming as means of expression, creativity, and wellness and to connect with others through music. But, not everyone sticks with that natural progression of rhythm, exploration and development, possibly because their own inner pulse needs a little help. Whether a drummer or percussionist follows the beat of their own heart to guide the rhythm, or employs a pulse track or metronome to trust, the results of practicing a pulse are spectacular. Not only can you connect to yourself and the planet, but, you build on your inherent knowledge of rhythm just by simply being in the rhythm, of being the pulse. We’ve all got a pulse, some of us are just better at hiding it than others!